Under-Secretary-General for Peacekeeping Operations Hervé Ladsous speaks to journalists in Bamako, Mali, during his visit. But not any longer, according to Hervé Ladsous, the out-going Peacekeeping chief, who said in his final interview with UN News that the department (DPKO) had become more efficient in recent years, without “lowering the quality” of often life-saving services it provides around the world. Around 126 countries contribute civilian, military and police personnel to DPKO, which has well over 100,000 people on active duty. Mr. Ladsous explained to UN News how the department had been able to cut the budget from $US8.2 billion down to $US7.2 billion since 2011, when he took on the job. UN News: During Friday's press conference, you said the entire budget for peacekeeping operations worldwide is down US $7.2 billion and that the cost for each peacekeeper fell 16 per cent in recent years. How did you manage that without hurting day-to-day operations? Hervé Ladsous: Simply by being more efficient, and I have to stress without lowering the quality of the equipment or the services we were providing. I think it shows that we want to be good stewards of the resources that are given to us. 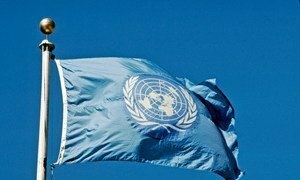 UN News: If there were to be further budgetary cuts, how would this affect the UN? Hervé Ladsous: Well I of course note that it is for the Security Council to decide on our mandate, and on our ceilings of staffing. We will have to stress that in some circumstances, reductions might have operational consequences on the ground. But we will remain, as ever, in very close touch with all the Member States of the Council and, further down the road of course, with the Fifth Committee (Advisory Committee on Administrative and Budgetary Questions). UN News: You've touted the technological advances that are helping to improve the work of peacekeepers on the ground – can you give us some examples? Hervé Ladsous: Of course. The obvious one is the unmanned aerial vehicles (UAVs), which are now becoming standard in most of our operations – both the big drones and the smaller ones. But I do stress surveillance drones, of course not tactical machines. But it's also about getting detection radars for weapon attacks; it's about tethered balloons – to watch over a city like Bangui, with cameras and thermal senses – which really allow us to see what is happening. UN News: If you look at all the conflicts that are taking place on the ground, it seems that the peacekeeping operations have had to stretch a bit to be able to accommodate all these crises. What has it been like? Hervé Ladsous: Stretch, yes of course, but when we had the peacekeeping summit two years ago, it translated into many offers by contributors of troops and police, both old and newer ones. We've had to operationalize these offers and now we have reached a point where we will have the capacity to deploy a vanguard brigade within thirty to sixty days, which simply was impossible only two years ago. So, stretch I'm not sure is really the word. The problem, though, has to do with the enablers and with the equipment of certain units, and we are constantly working with those countries to help and improve. We are trying to be creative, to address those issues in the most effective way. Women are still underrepresented in peacekeeping and UN Secretary-General António Guterres recently spoke of improvements to peacekeeping operations and a commitment to gender parity. He intends to ensure that women hold senior roles at the UN and that women continue to be represented at all levels of the Organization. Pictured here is the all-female police force from India providing backup on patrol for local unarmed Liberian National Police. Photo/Christopher Herwig. UN News: The Department of Peacekeeping Operations has managed to get more recruits from the global north compared to the global south which has been contributing more troops over the years. What has changed? Hervé Ladsous: I think this was one of the subjects on which I worked a lot over these five years because it seemed to me that the situation was unfair. The burden was not shared equally. We haven't reached a point where we can say the job is done but certainly there has been a trend and when we look at the mission in Mali, MINUSMA, you have no less than seventeen European countries – European Union countries – who are represented by staff or personnel of that mission. In the Central African Republic I have not forgotten that it was the Europeans, indeed, who came to provide a kind of buffering between the African Union and a full deployment of the UN troops. So I think this is something that has to be encouraged because ten years ago many of those countries were heavily involved in Afghanistan. Now that of course has disappeared essentially from the screens and I think they came to realize that coming back to peacekeeping in the UN context is something that is desirable. UN News: Your department has also been trying to increase the participation of women in peacekeeping operations, but women are still underrepresented and why is that? Also I have set a goal for military officers – staff officers – to get also 20 per cent of female officers, as soon as possible. Hervé Ladsous: That is true and of course, we haven't made as much progress as I would have wished but of course you have to be aware that the sociology of the armies of the main countries of the world is not a very feminine one. So we can hardly be expected to do much better than the Member States who provide us the personnel. We are doing rather a little better for police personnel. We stand, I think, right now at 12 per cent and the goal is that we may reach twenty per cent, which I think we may be able to do. Also I have set a goal for military officers – staff officers – to get also 20 per cent of female officers, as soon as possible. But it requires a lot of work, and of course, the active cooperation of those countries who contribute troops and police. VIDEO: During his exit interview with UN News, the outgoing UN peacekeeping chief Hervé Ladsous said that there should not only be “zero tolerance” for sexual exploitation and abuse but also “zero occurrence.” He also highlighted the importance of training on the issue, and the need for troop-contributing countries to do their part. Hervé Ladsous: Exactly, that's true. I was in South Sudan last week, and it's the same. You see, this has been a trend that the Security Council gives us mandates, but in contexts which are not exactly those that we would hope to find. So of course one of the permanent goals for those missions – and it's been certainly the case in Mali, it is the case presently in South Sudan – is to try to support those particular countries of the region who try to engineer a peace agreement, and of course implementing those agreements then becomes our responsibility. But there have been some very delicate transitions and of course situations which exposed our people to greater risk obviously. I haven't forgotten the short-lived supervision mission that we dispatched to Syria in 2012. After four months we concluded that. This was not for us, definitely. There was no peace, nor was there any hope at the time of seeing the process developing. UN News: The issue of sexual exploitation and abuse by UN staff in countries like CAR, DRC, Haiti, just to name few, made big splashes in the news and tainted the name of peacekeepers, although it is a system wide problem. Do you feel that DPKO handled this issue correctly and is it on the right path to rid itself of the scourge? Hervé Ladsous: I think we have always taken this very seriously. The new Secretary-General has put even more emphasis by putting out his plan of action which builds and prolongs a number of things which we had already done. I think it is absolutely a necessity. It's a shame that a few people, you know, smear the reputation of the vast majority of the peacekeepers and, of course, we should not forget the member states who contribute the troops and police have to do their share. It's not only the responsibility of the secretariat. Secretary-General António Guterres is committed to reforming the United Nations and stands ready to discuss with the United States and any other Member State how best to create a more cost-effective Organization that can tackle the enormous challenges facing the international community, his spokesman said today.